Today Parsi’s celebrate Jamshedi Nauroze and will engage in celebrations, largely featuring good food and drink. They are possibly the smallest but most visible Indian minority. You will find a Parsi in every nook and corner of the world. This community has many luminaries, the “firsts” in diverse professions, and it is not possible to elaborate on their achievements. We list a few instantly recognisable luminaries, who by their contributions have left an indelible stamp of excellence on their chosen professions. Sir Jamshedji Jeejeebhoy’s grit, business acumen, absolute integrity and honesty established his reputation. As his wealth increased, he donated generously and was involved in several philanthropic activities. For his munificence the British conferred upon him the unique honour of Knighthood on March 2, 1842, bestowed to an Indian for the first time. In 1857 he was given a higher honour that of Baronetcy and the hereditary title of Jeejeebhoy, which was inherited by his eldest son Cursetjee Jeejeebhoy. 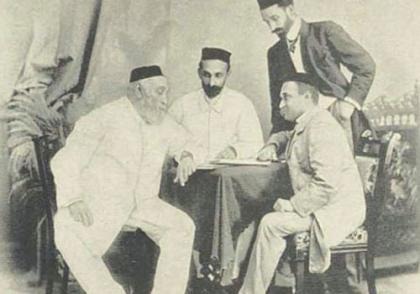 Sir Pherozeshah Mehta was the first Parsi to obtain a Master’s degree from the University of Mumbai. He established practice in the legal profession, which was till then dominated by the British. He drafted the Bombay Municipal Act of 1872 and is considered the father of Bombay Municipality. He was among the founders of the Indian National Congressand was its president in 1890. In 1887 and 1893 he was nominated to the Mumbai Legislative Council, he was also member of the Imperial Legislative Council, appointed a Companion of the Order of the Indian Empirein 1894, and a Knight Commander in 1904. He started Bombay Chroniclein 1910, an English weekly chronicler of the political upheavals of a volatile pre-independent India. The Tatas, known for their philanthropic acumen, was founded by Sir Jamsetji Tata in the mid 19th century. He and those who followed him aligned business opportunities with the objective of nation building. The family shares a set of five core foundation values: integrity, understanding, excellence, unity, and responsibility. This is a legacy that earned them the trust of many millions, in a measure few business houses anywhere in the world can match. Sir Nusserwanjee Wadia started the first textile company in 1879. Bombay Dyeing is the major brand and revenue source. His son Nusli Wadia, and Jeh Wadia have taken the entrepreneurial spirit forward. Into the fourth generation, the Godrej group is over a century old. Started by Ardeshir Godrej in 1887, the three generations have built the group. Awarded the Citizen of the Year in 2003 by the Economic Times for its contribution to social development, the family strongly believes in the trusteeship role. Minocheher Masanialso known as Minoo Masani was the leader of the opposition in Parliament. Homai Vyarawalla, the first woman press photographer, was awarded the nation’s second highest civilian honour, the Padma Vibhushan. Fiercely independent, disillusioned when the Nehruvian dream began to falter she quit her profession giving her entire collection of prints, negatives, cameras and other memorabilia to the Alkazi Foundation for the Arts, New Delhi. The founding directorand professor of physics at the Tata Institute of Fundamental Research, Homi Bhabha the first Chairman of the Indian Atomic Energy commission was the most prominent nuclear scientists to emerge from India. Known as "fatherof Indian nuclear programme", he was the founding director of Tata Institute of Fundamental Researchand Trombay Atomic Energy Establishment(now named after him); both cornerstones of Indian development of nuclear weapons. Among prominent legal luminaries, Fali Nairman, Chief Justice of India 2001-2002, is among the most respected and learned legal minds in the country. Former member of the Rajya Sabha, he lived amid controversy and the search for justice and truth. “One thing about our tiny Parsi community that you must know is that, to us the one thing greater than being a Parsi is being an Indian,” he said. Chief Justice Sarosh Kapadia rose from a lower middle class background with no godfathers, political connections or caste reservations. No doubt being born into a community that is universally well regarded helped. His grit, determination and tenacity got him to where he is. Movie producer Sohrab Modi, the Cecil B DeMille of Indian Cinema, (1897–1984) stage and film actor, director and producer, his historical films carried a message commitment to on social and national issues. He received the Dadasaheb Phalke Awardin 1980. Homi Wadia, doyen of Indian cinema, a producer -director of silent movies in the 1930s set up Movietone Studio. His movie Hunterwalli with Nadia followed by Hunterwalli ki Beti, flipped box office records. When I interviewed him in 2002 his memory of the 1930’s was as sharp as a pin. Mehli Mehta born in Bombay, a pioneering figure in the Indian musical world, founded the Bombay Symphony Orchestrain 1935 and the Bombay String Quartetin 1940. His son, Zubinis legendary. Farrokh Bulsara (1946-1991) more famous as Freddie Mercury, a musician, singer and songwriter, the lead vocalist of the rock band ‘Queen,’ Britain’s first “Asianrock star" was born in Zanzibar, left India in his mid-teens, is voted the greatest male singer of all time. Cyrus Todiwala cooked his way into British hearts. Training as a chef with the Taj group for over 15 years has excited the palates of the curry savvy British, and was awarded an OBE. His Café ‘Spice Namaste’, a landmark in London is listed amongst the top 100 restaurants of the city. Zerbanoo Gifford is a Human Rights campaigner. She is the founding director of the ASHA Foundation. Honoured with the Nehru Centenary Award for her work championing the rights of women, children and minorities, made political history in 1982, when she was elected in Middlesex, as the first non-white woman councillor for the Liberal Party. Despite facing racism and threats from the British National Party, is the first Asian woman to stand for parliament three times. Today, there are about 150,000 Zoroastrians worldwide. While India houses the largest population the Greater Toronto Area comes second. Khursheed Jeejeebhoy, Toronto’s top gastroenterologist at St Michael’s Hospital is recipient of 23 international awards and author of 300 research papers. The late Dr Nani S Davar was principal, Davar’s College of Commerce, one of India’s oldest and most reputed institutes. His wife Puran now heads the professional team in imparting skills that make a perfect Millennium Secretary, with diverse career oriented courses for successful careers in blue chip companies. Starting with one Institute in Bombay, they have several branches and presence in all Metro’s in India. This sprightly eighty two year old, always impeccably dressed, stopped teaching a few years ago, still drops by at the institutes everyday to supervise administrative work. "What will I do sitting at home?”A decade ago, when I interviewed her, she said, “Shiamak is the famous one, why interview me? We had an inkling he’d be a performer since he was into dance and music from an early age. Back then, people ridiculed him. ‘What is a boy doing dancing?’ But we encouraged him. Our only condition was that he complete his graduation before moving on to anything else. I am Shiamak’s mascot," she laughs, “I always travel with him for his shows aboard.” Shiamak’s success makes her beam. Shiamak, is India’s first Contemporary Dance Choreographer, famous for changing the choreography of Hindi cinema, the first Indian to bring Contemporary Jazzand western forms of dances through his first of its kind dance schools.